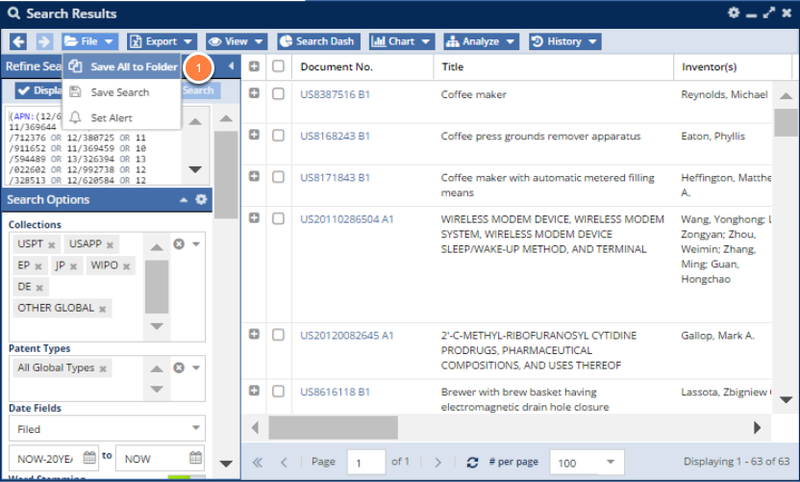 AcclaimIP's importing feature imports document numbers that are either are patent numbers or application publication numbers. You cannot import application serial numbers in the form of 12/123456 directly into AcclaimIP, but there is a work around. This technique is particularly helpful when you want to check the publication status of your applications in progress. The application serial number (APN) can be downloaded from ANAQUA (or if you have a different IAM (Intellectual Asset Management) software, it might be found in there as well). 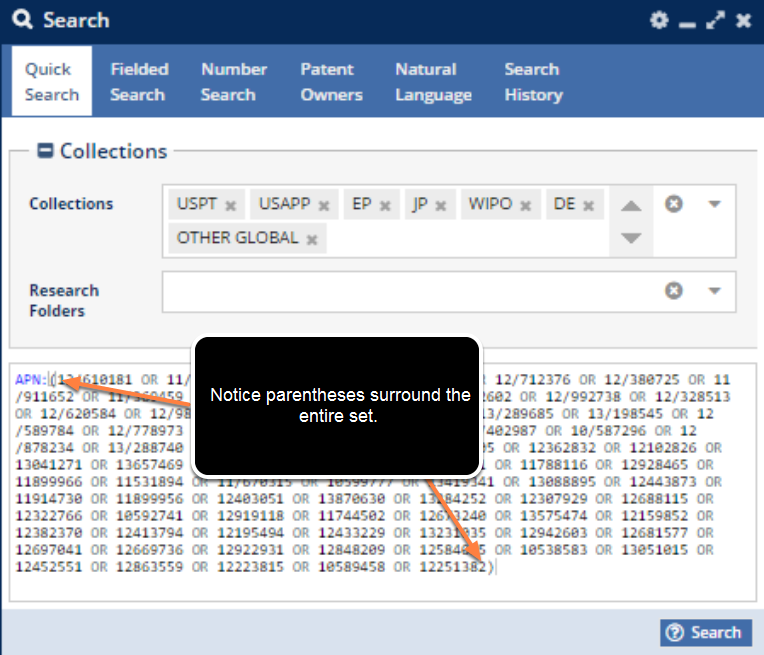 Note: When performing these searches, you are limited to 1,000 patent numbers per clause. If you want to import more than 1,000 APNs, break up the query into two or more clauses. This technique is shown below. Use your spreadsheet software's concatenate function to create a list of application numbers with " OR " between each application number. Notice that the format is "spaceORspace" between the numbers. It won't work without the spaces! Copy the last cell from Column B into your copy buffer. The query you make will look like the example above. Notice the query is in the following form: APN:(12/610181 OR 11/593400 OR 11/369644...). Be sure to include the parentheses around the entire set of application numbers. This is so the APN field query applies to the entire set. This is still one query, but it is broken down into multiple APN clauses. Note that you can also, in your Excel worksheet, add a blank column next to the application number column, and simply add OR all the way down (except for the last application number). 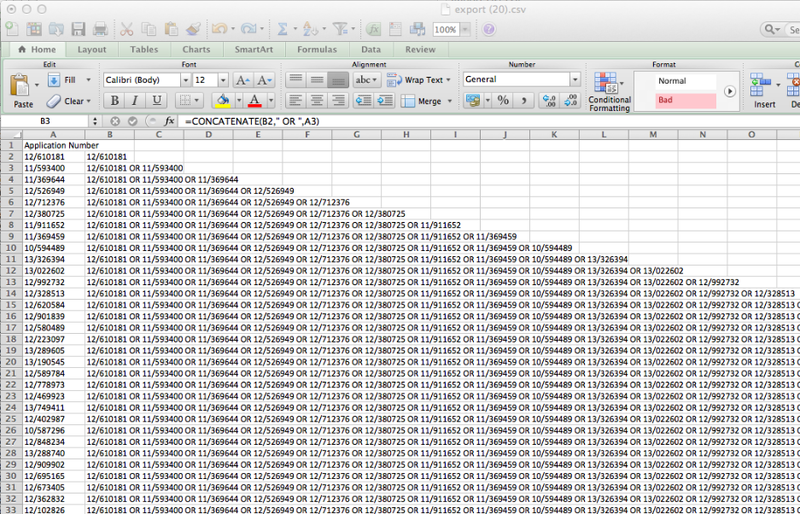 Then copy both columns at the same time and insert them into the APN search's parenthesis. This is much less clean than the above method, but does also work. Once you have run the search, you can save your results to a Research Folder (1) from the Search Results window. Depending on what APNs you use, you may find that the results are sparse. Remember that AcclaimIP has access to the public data. If the document is not yet published, AcclaimIP will not recognize the number. In other words, the search results will only include those APNs with a corresponding published document.